USS Hancock casualties buried at sea, April 1945. A coincidence of the calendar and the phases of the moon made 1 April 1945 and 2018 both April Fool’s Days and Easter Sundays. But fate made 1 April 1945 the start of the US invasion of the island of Okinawa, the deadliest battle of the Pacific. The battle for the island continued until 22 June 1945, resulting in more than 250,000 deaths: 12,000 American military, 100,000 Japanese military, and 140,000 Okinawan civilians. As many people died in that one battle as died in the atomic blasts at Hiroshima and Nagasaki combined. USS Texas at sea, with two Quad 40 antiaircraft guns at the fantail—the very end—of the ship. But even as the death toll climbed at Okinawa, as faceless lives were lost by the thousands, each life still mattered. 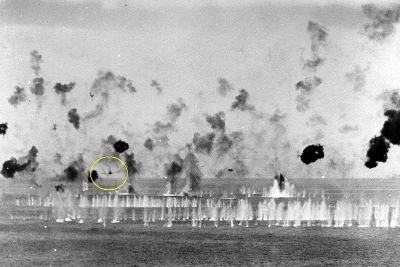 Gun crews on the USS Texas track—and kill—a Kamikaze as it heads for her decks. Days later, an enemy soldier was also spotted in the water. A whaleboat is sent out to pick him up. 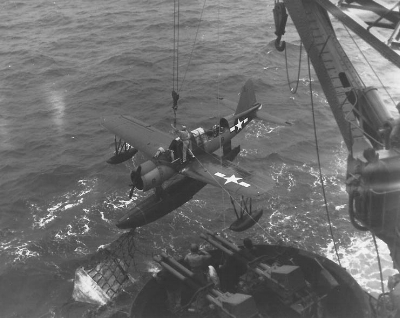 Kingfisher spotter plane is hoisted back onto deck on the USS Texas. The struggle to save each life, even in the face of countless deaths, even in the midst of endless killing, is personal. The lesson of Okinawa’s huge death toll was that the seemingly inevitable invasion of Japan would result in millions of deaths: accepting defeat was a foreign concept to Japanese culture. Harry S. Truman, the new president following Roosevelt’s death on April 12, made the decision to use atomic weapons to convince them to surrender. Thus, the half million war-deaths in the Pacific from April through August was considered a success compared with the millions who might have died.